The Lightning Car Company today announced its development of a range of 700 bhp Lightning electric cars, for the first time genuinely harnessing electric motive power and uniting it with class-leading sports car design, engineering and production. The remarkable car range has been conceived to satisfy three essential criteria, namely to deliver a highly stylised, graceful sports car with cues hinting at the quintessential British treatment of Aston Martin or TVR while delivering an explosive, dynamic performance based on new breakthrough electric technologies that make the ownership experience quicker, easier and cleaner than traditionally fuelled cars. The Lightning Car Company draws upon 25 years of automotive experience from design and engineering personnel whose industry experience includes McLaren, Lola, Ronart and Vanwall, as well as championing the adoption and use of new generation electric battery and motor technologies derived from application in the aerospace industry. The business owners jointly share a clear vision of an electric-powered future for high performance motoring. The Lightning began life as a traditionally powered petrol vehicle in order to develop the car's chassis dynamics. Battery and motor technology applications allow the handling characteristics of the car to be optimised. The chassis derives its inherent dynamic quality from its aluminium honeycomb and carbon composite monocoque structure, essentially a Formula One derived concept that blends low mass with high impact qualities. Arthur Wolstenholme, Technical Director at Lightning explains, "Ten, or perhaps even five years ago, electric power was dismissed as a poor substitute for petrol, diesel or LPG. But the world has moved on significantly – from military and aerospace applications, electric motor and battery technologies have been developed that will enable the Lightning to demonstrate 700 plus bhp performance over a range that exceeds some of today's petrol performance cars. What's more, the Lightning is intended to compete with premium market sport cars, but our electric power should outstrip the response rates, torque characteristics and driveability of most exotic performance super cars. Electric power has truly arrived in the performance market." The Lightning is set to dismiss all the preconceptions about electric power. It will be there immediately, and in abundance, providing amazing responsiveness. And, with a chassis designed to be more than capable dynamically, will make a great point to point proposition to rival the established guard. The Lightning will combine high performance electric motive power with an advanced regenerative energy system that recharges the car's batteries under braking by capturing lost friction energy. This emerging technology utilised by Lightning in the road car sector will be adopted by Formula One from 2008 when KERS (Kinetic Energy Recovery Systems) become mandatory. The Lightning's use of this technology enables the range of the car to be extended to over 250 miles/400km. With concourse elegance, blistering performance (expected to be a 0-60 time of sub 4 seconds) and a ten minute charge time to sustain a 250 mile range, the ownership costs of the Lightning range are set to be significantly lower than traditional fossil fuelled vehicles, with exemption from road tax, congestion charging and an urban cycle energy cost estimated at 2.2p per mile, the Lightning could be as much as £10,000 per year cheaper to run than a Audi RS4 based on an average 20,000 miles of motoring. There are 3 Lightning models planned, a Grand Tourer, a competent and quick car which maintains a depth of luxury and specification; the Lightning Sport is the GT's lightweight, purposeful cousin, with the ability to achieve 0-60 in under 4 seconds. The third Lightning will be an extended range model, with the capability of reaching an estimated 250 miles on a single 10 minute charge. 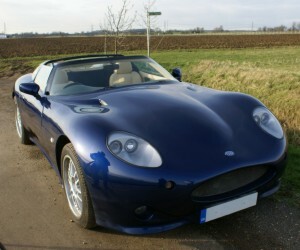 The electric Lightning prototypes are now in development and pre-orders are being taken for 2008 delivery. Customised options for interior and exterior finishes and accessories will be available on a build to order basis. SAFER - NanoSafe™ batteries use nano titanate materials instead of graphite which makes them far more thermally stable - there are no toxics or heavy metals used in NanoSafe™ batteries. LONGER-LASTING - NanoSafe™ batteries have a life expectancy of 12+ years, versus the 3-5 year life of other batteries. NanoSafe™ can retain up to 85% charge capacity after 15,000 charges. FASTER CHARGE - NanoSafe™ batteries can be recharged in approximately 10 minutes, rather than the hours required by many other rechargeable batteries. MORE POWERFUL - With instantaneous power even at extreme temperatures, NanoSafe™ batteries deliver power per unit weight and unit volume several times that of conventional Lithium-Ion batteries. Hi-Pa Drive™ is a real revolution in motor technology and it's a British innovation to boot! With its integrated motor and drive electronics in one single unit it produces an ultra high power density - up to 20 times more than conventional systems. Upon braking, the car's kinetic energy is converted to heat through friction - throwing away the energy that was previously used to accelerate. In city driving, about 30 percent of a typical car's engine output is lost to braking. When an electric vehicle is decelerating, it does not create friction and useless heat in order to slow down. Instead it reverses its electric motor turning it into an electric generator, creating electricity which is fed back into the battery and stored for future use. In fact any time an electric vehicle decelerates it causes the system to use the vehicle's momentum to generate electricity.